Get that upcoming report done to the relaxing sounds of a campfire by the lake. When you need to focus on an important task, sometimes your favorite Spotify playlist just doesn’t help. If music tends to be more of a distraction during the grind, you might find customized background noises more effective at keeping you on task. That’s where Noisli for Chrome comes in. 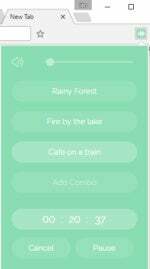 This extension, which is also available as an app on Android and iOS, offers a variety of generic sounds such as fire, wind, thunder, rolling waves, and so on. It also lets you combine them into your own personalized background noise mashup or use preset combinations. To get started, download Noisli from the Chrome Web Store. Once it’s installed it will appear as a green icon with a white sound wave. Click on it and the drop-down menu will have a 25 minute timer and an Add Combo button. To add a new sound, click Add Combo, which will open the Noisli site in a new tab in Chrome. Here you can select various noises by clicking on their icons. Once you click on them they will begin playing. Select as many as you’d like. To deselect a noise just click on it again. Once you’ve got a combination that you like, click the Save button at the top of the page. You’ll then be prompted to give it a name such as Cafe on a Train. Once that’s done, hit Enter and you’ve got your first background noise mashup saved to Noisli. Now that your sound combinations are set up, close the Noisli site. Next, click on the extension icon to see your saved sounds, click on the combination you want, and start working. 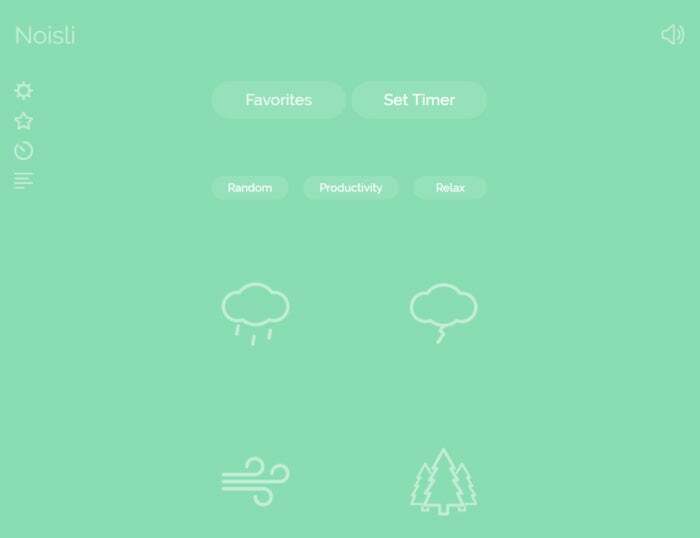 The extension also offers a timer that will automatically shut off Noisli’s background noises after a preset time. The default is 25 minutes, but you can change that on Noisli’s site. If you don’t want to bother creating your own combination use one of the preset buttons at the top of the page on Noisli’s site, such as Random, Productivity, or Relax.